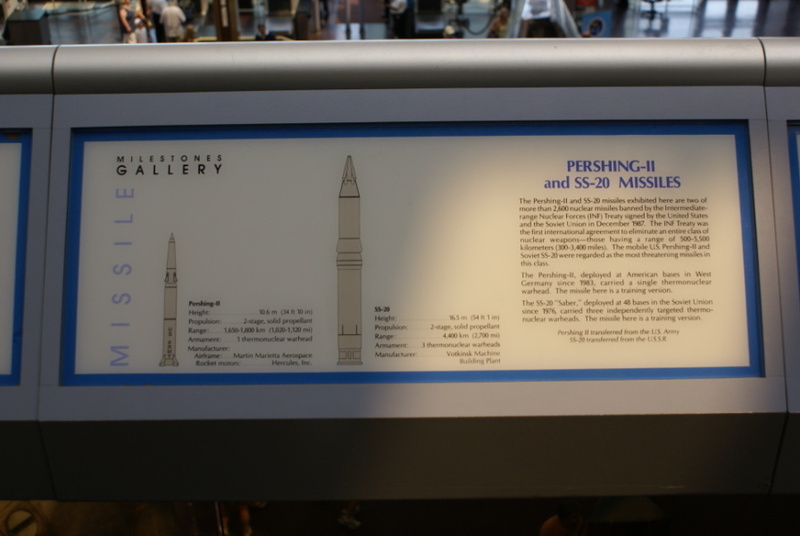 The Pershing-II and SS-20 exhibited here are two of more than 2,600 nuclear missiles banned by the Intermediate-range Nuclear Forces (INF) Treaty signed by the United States and the Soviet Union in December 1987. The INF Treaty was the first international agreement to eliminate an entire class of nuclear weapons–those having a range of 500-5,5500 kilometers (300-3,400 miles). The mobile U.S. Pershing-II and Soviet SS-20 were regarded as the most threatening missiles in this class. The Pershing-II, deployed at American bases in West Germany since 1983, carried a single thermonuclear warhead. The missile here is a training version. The SS-20 "Saber," deployed at 48 bases in the Soviet Union since 1976, carried three independently targeted thermonuclear warheads. The missile here is a training version. SS-20 transferred from the U.S.S.R. I did not take photos of these missiles, although they are visible in the background of my photos of the X-15, XP-59A Airacomet, and Gemini 4. The Redstone Arsenal, under whose guidance the Pershing family of missiles was designed, has a page on the Pershing missile. The Pershing II is NASM catalog #A19910037000 and the SS-20 is #A19900275000.